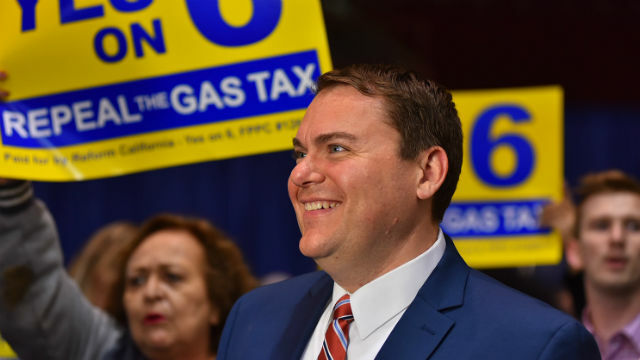 “We will fight,” chanted backers of local radio host Carl DeMaio and his drive to repeal the Senate Bill 1 gas tax. With 93 percent of precincts reporting Wednesday morning, DeMaio’s Proposition 6 was trailing by more than 10 percentage points. Tuesday night, DeMaio made the interview rounds, trying to explain the defeat. So what will the former San Diego City Council member and congressional candidate do next? He said he’d look at launching new ballot measures. What accounted for the loss besides the ballot title? “We were outspent 20-to-1,” he said. DeMaio said he’d return to his KOGO platform. Other high profile propositions on rent control and tax breaks for senior citizens were also losing. The measure was trailing badly — 62 percent no to 38 percent yes. No led yes 58 percent to 42 percent. Yes led no 54 percent to 46 percent. Yes led no 61 percent to 39 percent. No led yes 52 percent to 48 percent. Yes led no to 60 percent to 40 percent. No led yes 62 percent to 38 percent. Yes led no 60.5 percent to 39.5 percent.